Coronary artery aneurysms (CAAs) are uncommon findings. Atherosclerosis is the pathogenetic cause in about a half of acquired CAAs. They often are multiple and relatively small, not detectable by ultrasounds. We present an unusual case of giant, isolated right coronary artery (RCA) aneurysm noted by transthoracic echocardiography. The images show typical echo features which allowed us to exclude alternative diagnoses and be oriented toward a coronary ectasia. A 71-year-old Caucasian male was admitted to our division for unstable angina (new-onset angina for mild effort, Canadian Class III). His past medical history was unremarkable. Cardiovascular risk factors were hypertension, hyperlipidemia, and family history of coronary artery disease. Resting electrocardiographic showed no major abnormalities. Routine laboratory investigations were within the limits of normal, except for low-density lipoprotein cholesterol (120 mg/dl). Troponin I was negative. An echocardiogram was performed on admission; it showed mild-left ventricular hypertrophy with normal chamber dimensions, and a mid-distal anteroseptal hypokinesia, with mildly impaired EF (46%). The right sections appeared normal in size and function; however, a round, smooth cystic, mobile mass was noted in the atrioventricular groove [Figure 1] and [Video 1]. It appeared saccular from subcostal view, 3.6 cm long and 2.7 cm wide, with a thick echodense border and hypoechoic content [Figure 2] and [Video 2]. It did not fill with color Doppler. For further characterization, a bubble test was performed during the examination with agitated saline contrast medium injected through the right and left antecubital vein, and the mass did not take contrast. A modified 4-chamber view showed a possible connection between the RCA and the structure [Figure 1]; we supposed it was a CAA. 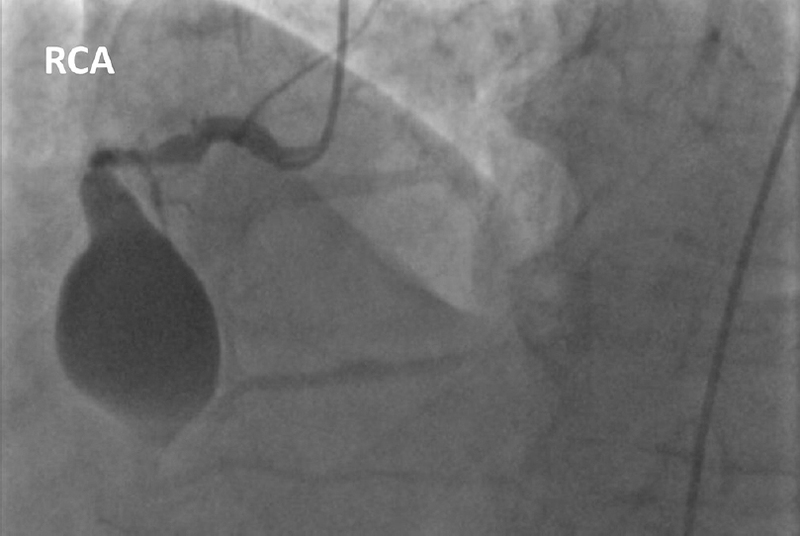 A coronary angiography was performed the day after, confirming the presence of a giant aneurysm of the mid-RCA [Figure 3]; two critical stenoses were visualized proximal and distal to the ectasia. 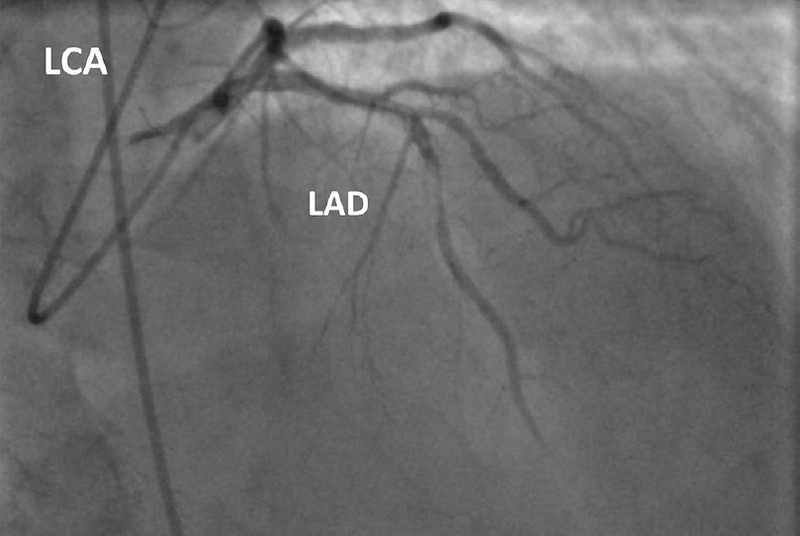 A 90% stenosis of mid-left anterior descending (LAD) artery was also detected in addition to a 70% stenosis of mid left-circumflex coronary artery; this vessel had, however, small caliper and distribution [Figure 4]. Angiography of the thoracic aorta was performed, showing no significant dilatations. After exclusion of significant carotid stenosis or abnormalities with a Doppler ultrasound and an ultrasound scan of the abdomen showing normal caliper and morphology of abdominal aorta, the patient underwent cardiac surgery a few days later. A venous bypass graft was created to the distal RCA, and the CAA was excluded by proximal and distal ligation. Significant ischemia was ruled out by intraoperative echo after ligation. A left internal mammary artery–LAD bypass was also performed. No significant perioperative complications occurred. The patient was asymptomatic at 2-month follow-up, without regional wall-motion abnormalities at the control echocardiogram. CAA is defined as a coronary dilation that exceeds by 1.5 times the diameter of normal adjacent segments. It is generally termed giant if its diameter exceeds the reference vessel by more than four times or if it measures more than 8 mm. According to its morphology, a CAA can be classified as fusiform or saccular. CAAs are rare (prevalence rate: approximately 0.3% to 5.3% of all coronary angiographies) and “giant” CAAs are very rare (prevalence: about 0.02%). Although inflammatory disorders (Kawasaki disease, Takayasu arteritis, and Behcet disease), connective tissue diseases (Marfan, Ehlers–Danlos), infections, and/or trauma are common etiologies, atherosclerosis accounts for approximately 50% of CAAs, often causing multiple coronary dilatations., CAA described in this report had atherosclerotic etiology; an isolated aneurysm of such dimensions represents a very unusual finding. The presence of two critical stenoses just proximal and distal to the ectasia has probably determined peculiar flow alterations, with increased parietal wall stress; this acted on a vessel segment interested by atherosclerotic modifications of intima and adventitia, leading to progressive dilatation. Moreover, the giant CAA was not clearly symptomatic in our patient: his angina was due to the critical LAD stenosis as documented by the anterior hypokinesia showed at echocardiography. Cardiac catheterization is the gold standard tool for the diagnosis of CAAs, providing information about the size, shape, location, and coexisting anomalies such as coronary artery disease and is also helpful for planning the strategy of therapy. However, the dimensions of a CAA can be underestimated if it contains substantial thrombus. Reliable noninvasive techniques for the diagnosis of CAAs are CT and cardiac MRI., Rarely, CAAs reach dimensions which make them detectable by echocardiography. Echocardiographic diagnosis and follow-up of giant CAAs are generally common in children with Kawasaki disease, while the clear visualization of a CAA in adult is rare and arouses differential diagnosis problems. Some peculiar echocardiographic aspects allowed us to formulate the correct diagnosis. First, the position of the mass adjacent to the right atrioventricular junction: the medium RCA is the most frequent location of giant CAAs., Even if the structure had a fluid content and appeared attached to the right sections, the contrast study showed clearly that it was not in communication with right cardiac chambers. It presented a thick border, and its location was apparently subpericardial: this excluded a pericardial cyst as a differential diagnosis. Again, the thick hyperechoic border, the location in the right atrioventricular groove, and the fact that it was not filled by contrast injected through antecubital vein made the diagnosis of coronary sinus ectasia and persistent superior vena cava nonconsistent. The described morphological aspects taken together were atypical for cardiac tumor. Given their rarity, there is no optimal management strategy for giant CAAs approved by controlled trials. Depending on the symptoms, etiology, and associated lesions, medical treatment, stent implantation, or surgical exclusion of CAAs using a resection or ligation technique have been described., In our case, cardiac surgery was the treatment of choice given the multivessel disease and the relatively low operative risk. It allowed clear visualization of the aneurysm; however, it was not clear if secondary vessels were originating from the ectasia. For this reason, the exclusion of CAA was at first provisional; after creation of the bypass graft and exclusion of significant ischemia with intraoperative echocardiography, definite ligation was realized with prolene suture. 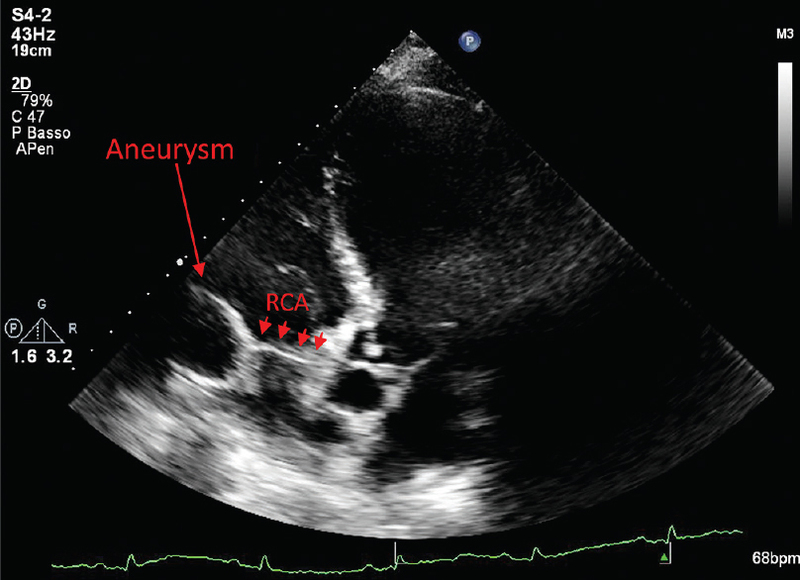 We reported a rare case of giant, isolated RCA aneurysm due to atherosclerotic disease. 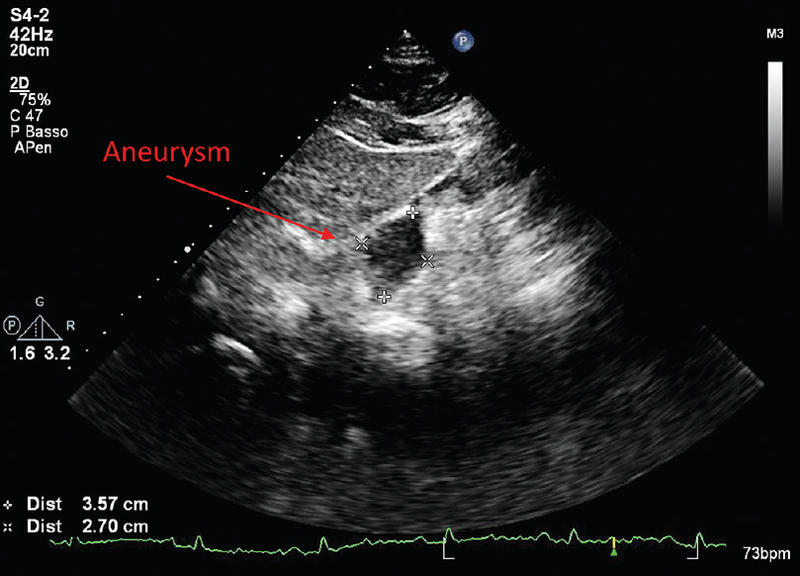 It was an incidental finding during transthoracic echocardiography performed in a patient with unstable angina. A comprehensive echocardiographic study leads to the right diagnostic suspicion. This brought the patient straight to coronary angiography, with confirmation of echo diagnosis and detection of severe three-vessel disease, and then to cardiac surgery without delay. To Gian Franco Pasini, MD; Maurizio Merlo, MD, who gave important contributions in the clinical management and treatment of the case. Cohen P, O'Gara PT. Coronary artery aneurysms: A review of the natural history, pathophysiology, and management. Cardiol Rev 2008;16:301-4. Demopoulos VP, Olympios CD, Fakiolas CN, Pissimissis EG, Economides NM, Adamopoulou E, et al. The natural history of aneurysmal coronary artery disease. Heart 1997;78:136-41. Halapas A, Lausberg H, Gehrig T, Friedrich I, Hauptmann KE. Giant right coronary artery aneurysm in an adult male patient with non-ST myocardial infarction. Hellenic J Cardiol 2013;54:69-76. Li D, Wu Q, Sun L, Song Y, Wang W, Pan S, et al. Surgical treatment of giant coronary artery aneurysm. J Thorac Cardiovasc Surg 2005;130:817-21. Manginas A, Cokkinos DV. Coronary artery ectasias: Imaging, functional assessment and clinical implications. Eur Heart J 2006;27:1026-31. Murthy PA, Mohammed TL, Read K, Gilkeson RC, White CS. MDCT of coronary artery aneurysms. AJR Am J Roentgenol 2005;184:S19-20. Adler AC, Kodavatiganti R. Kawasaki disease and giant coronary artery aneurysms: The role of echocardiography from diagnosis through follow-up. Echocardiography 2016;33:1245-50. Russo A, Favero L, Saccà S, Caico SI, Cernetti C. Coronary artery aneurysms. G Ital Cardiol (Rome) 2015;16:409-17.